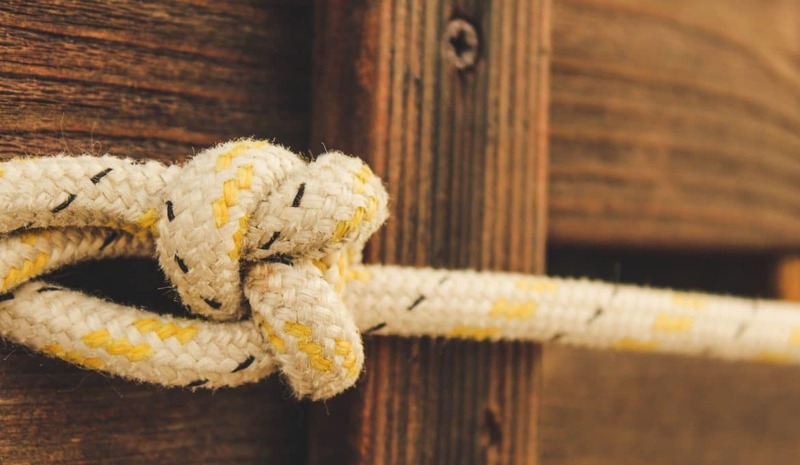 If you’re planning to spend time aboard a boat, it’s a good idea to familiarize yourself with how to tie nautical knots. 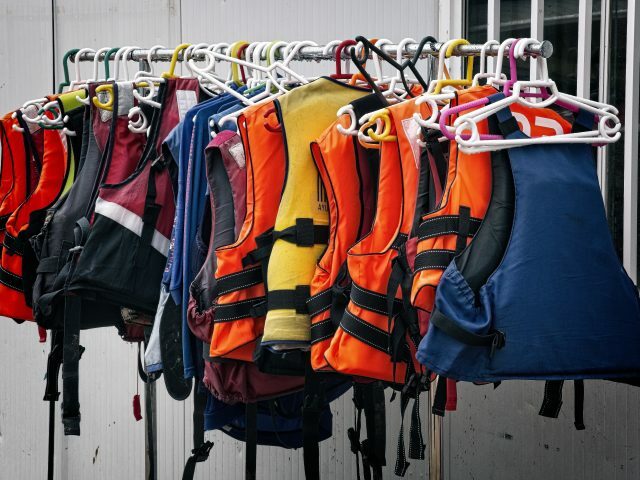 You’ll find countless situations in which you need to tie up your boat, tie some object to your boat or tie one line to another aboard your boat. 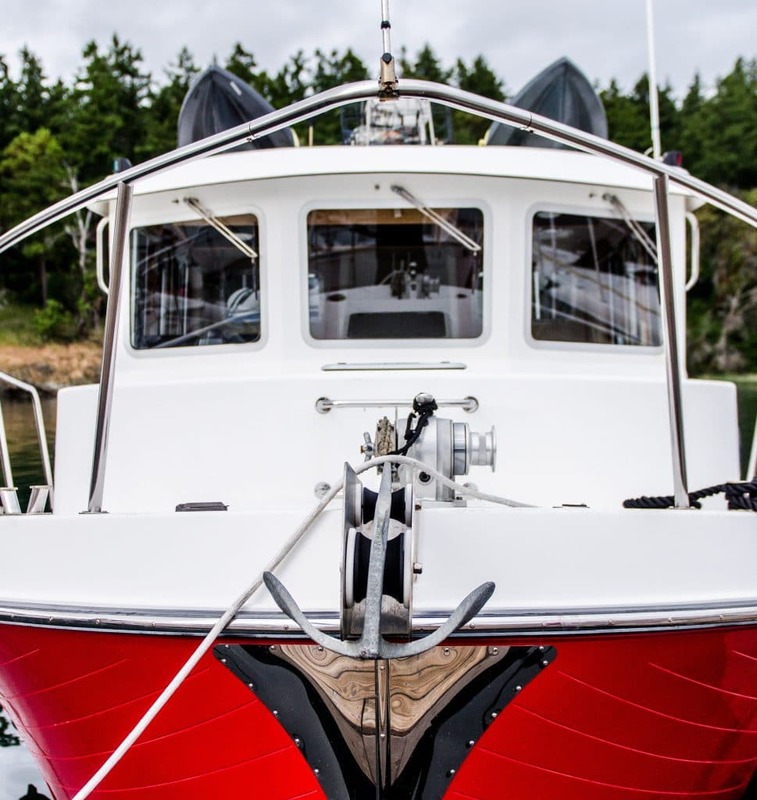 Nautical knots are the key to success in all of these situations. Unfortunately, you can’t just use any old knot to accomplish these objectives. 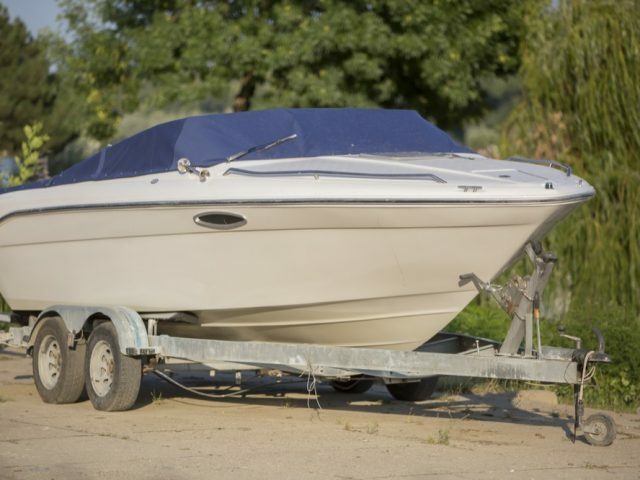 For example, the knot you use for tying your shoelaces simply isn’t going to cut it when you need to dock your boat securely. 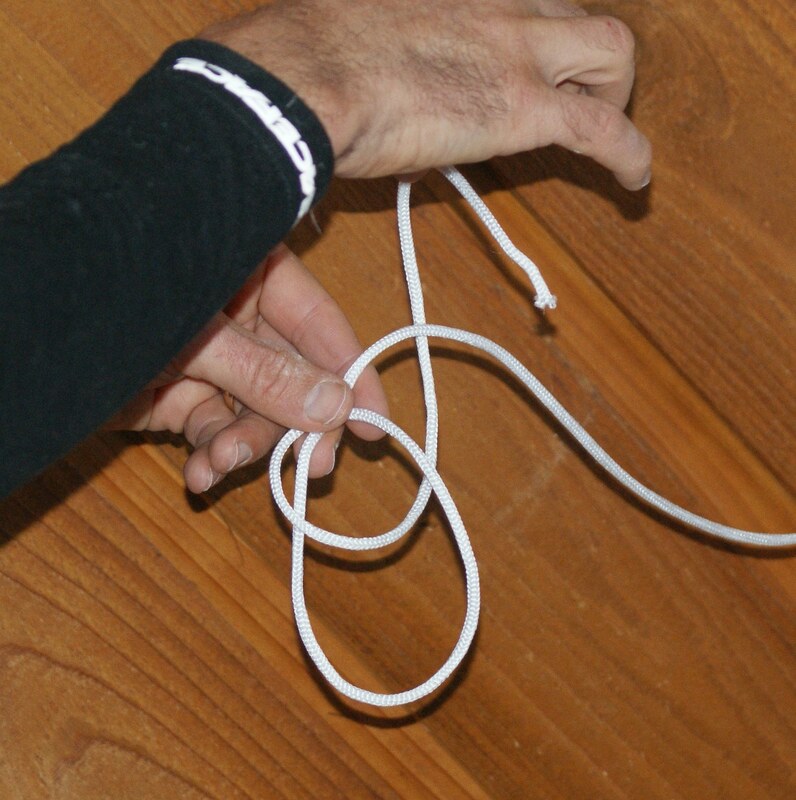 The knots you’ll tie need to be secure, which is one reason that boaters are so particular about the knots they use. 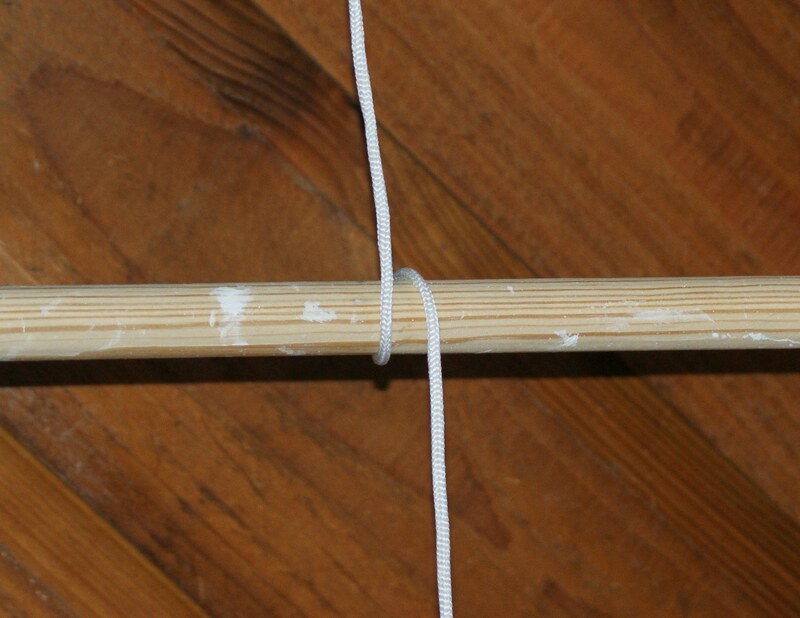 On one hand, you really can’t learn too many knots. They’re all useful to know. 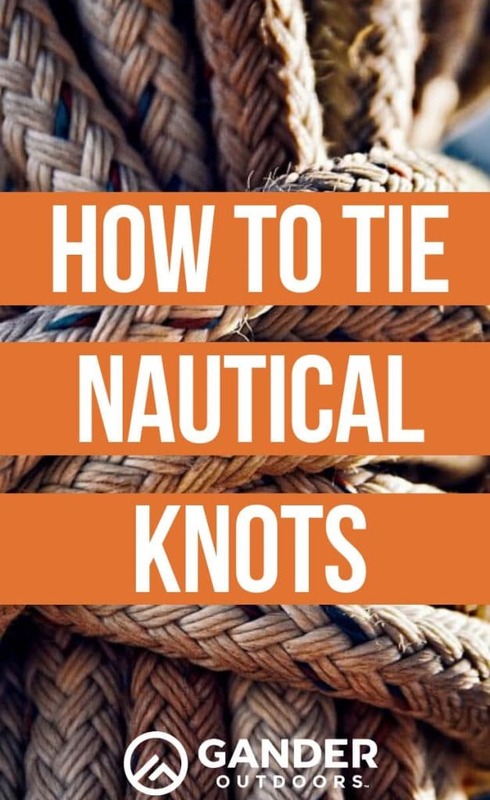 On the other hand, when my husband, Mike, and I were full-time cruising sailors, there were a few nautical knots we used often. 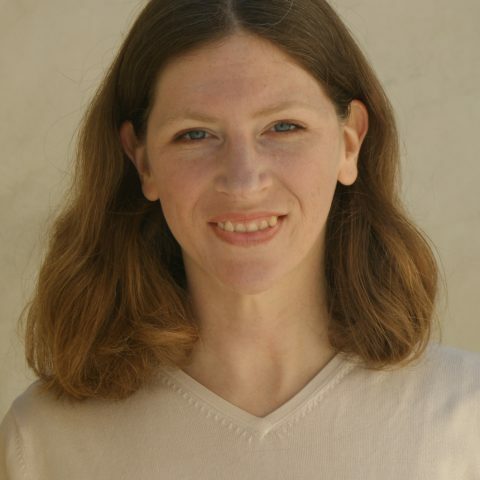 There were others we hardly ever needed. 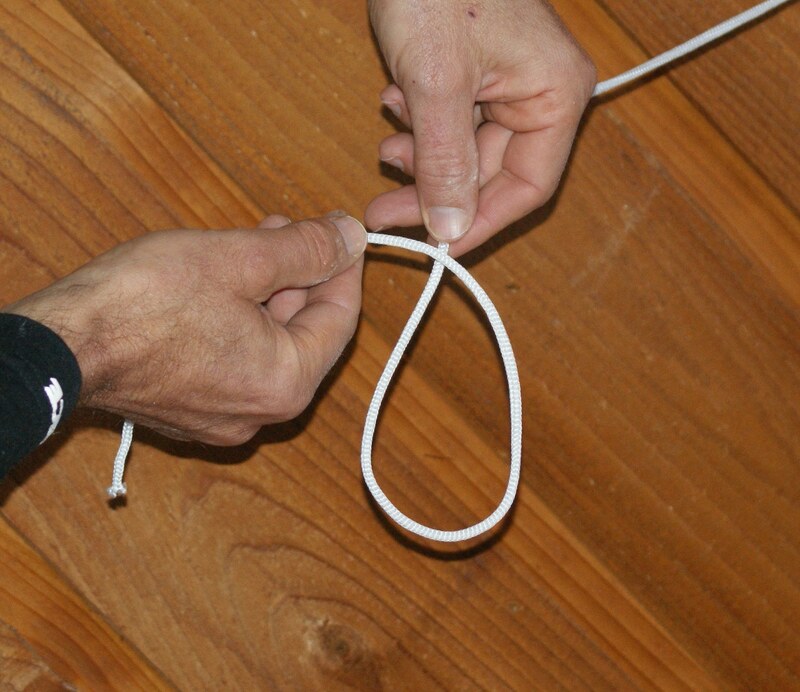 I’m going to show you how to tie several common nautical knots we’ve used on a regular basis. 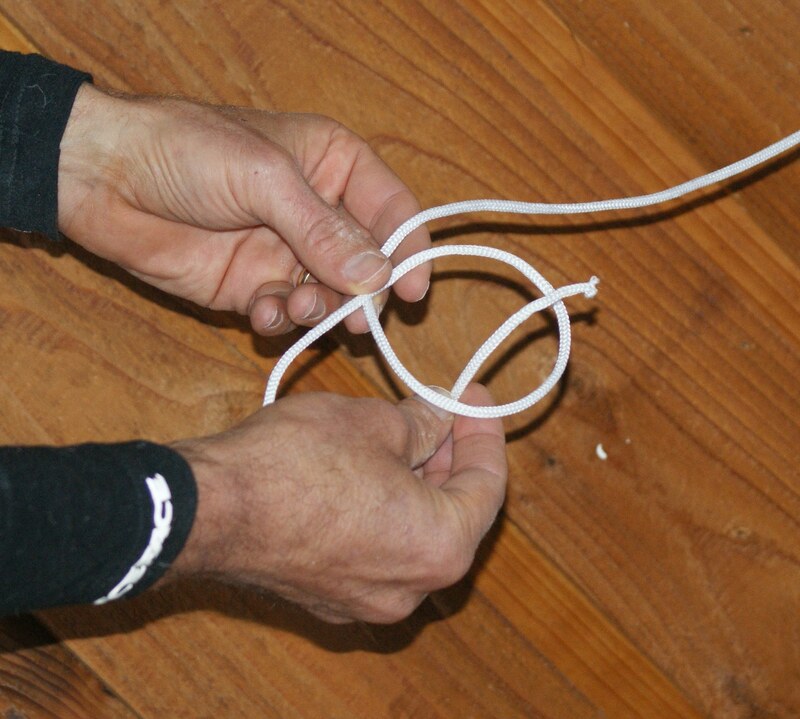 The bowline knot is the knot we’ve used most often as cruising sailors. 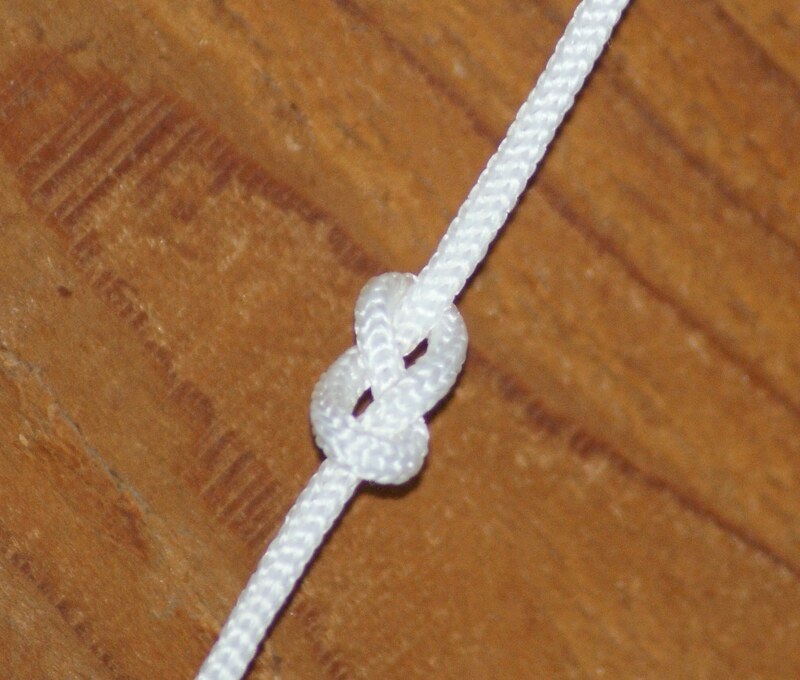 Don’t let the name of this knot fool you. 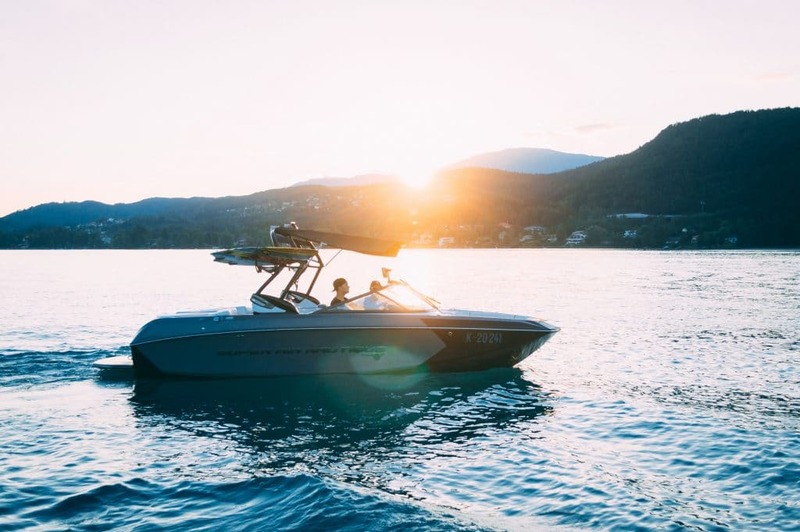 You can use it for attaching the bow of your boat to the jetty when you dock the boat; however, there’s no good reason to avoid using it for tying the stern of your boat, too. 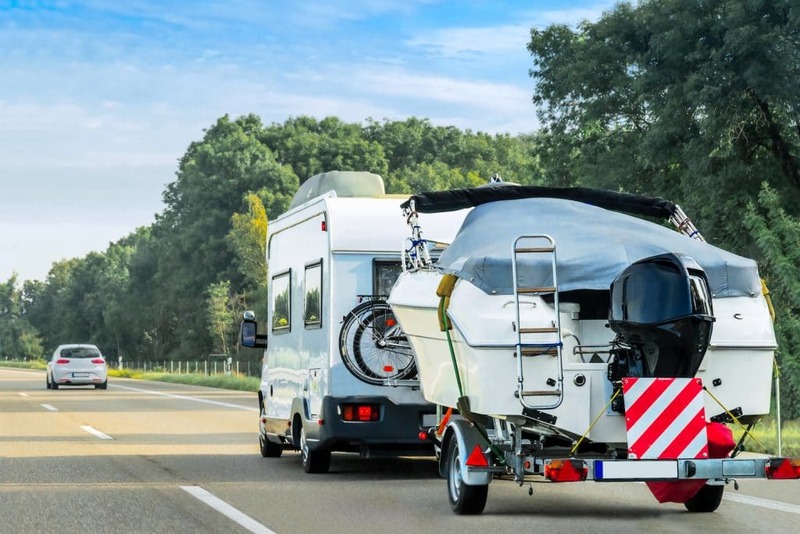 You might also use this knot for towing and a broad variety of other purposes. 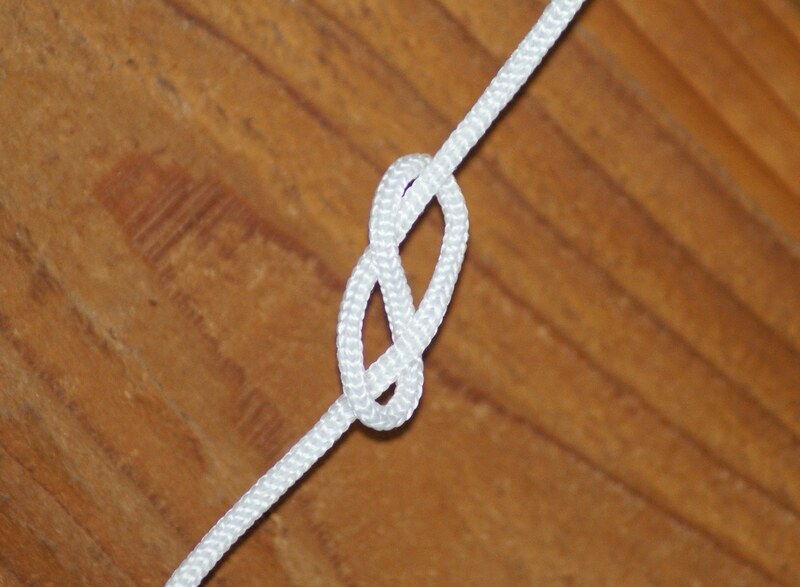 If you don’t already know how to tie this knot, your future self will thank you for learning it. When Mike was a kid, he used to be a Sea Scout. 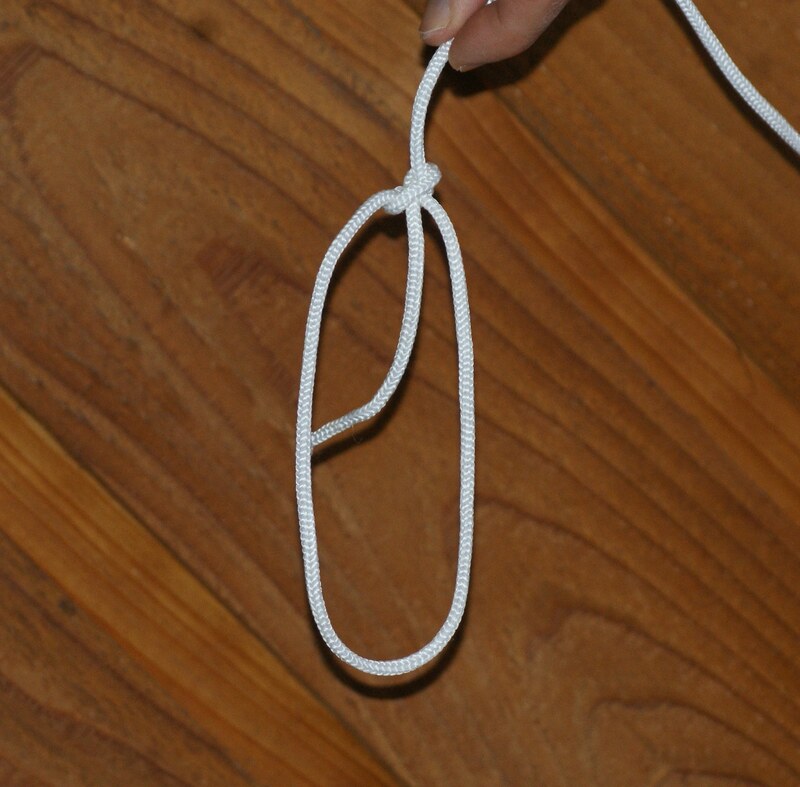 One of his fellow Sea Scouts taught him the bowline knot by explaining that the knot is like a rabbit. I’ll explain more about the rabbit analogy momentarily. 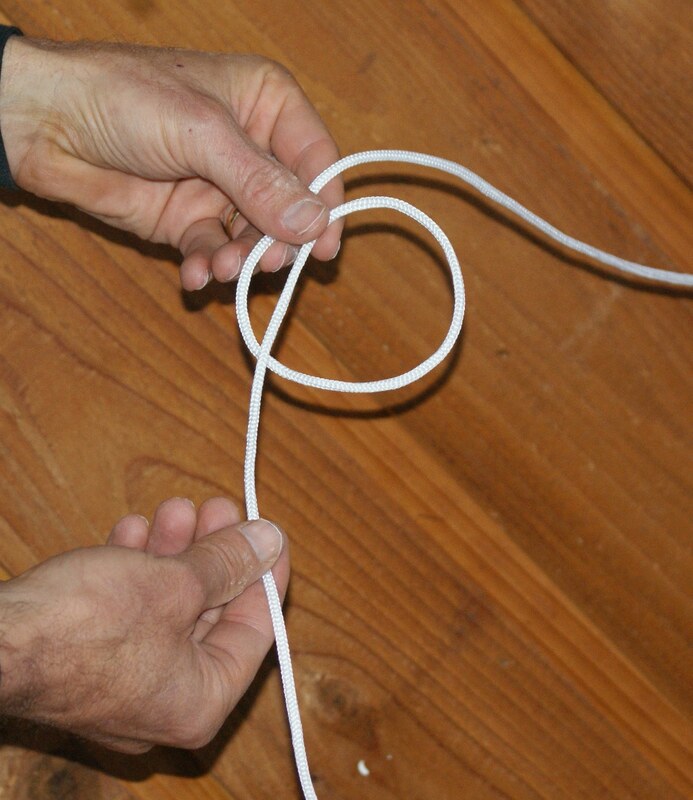 When you tie the bowline knot, the first thing you want to do is construct a rabbit hole for your rabbit — like this. Next, you’re going to have to fire up your imagination and pretend the end of your line is the rabbit. Pretend the other end is a tree trunk near his rabbit hole. Your rabbit is going to go up through his rabbit hole — like this. …and back into his rabbit hole. 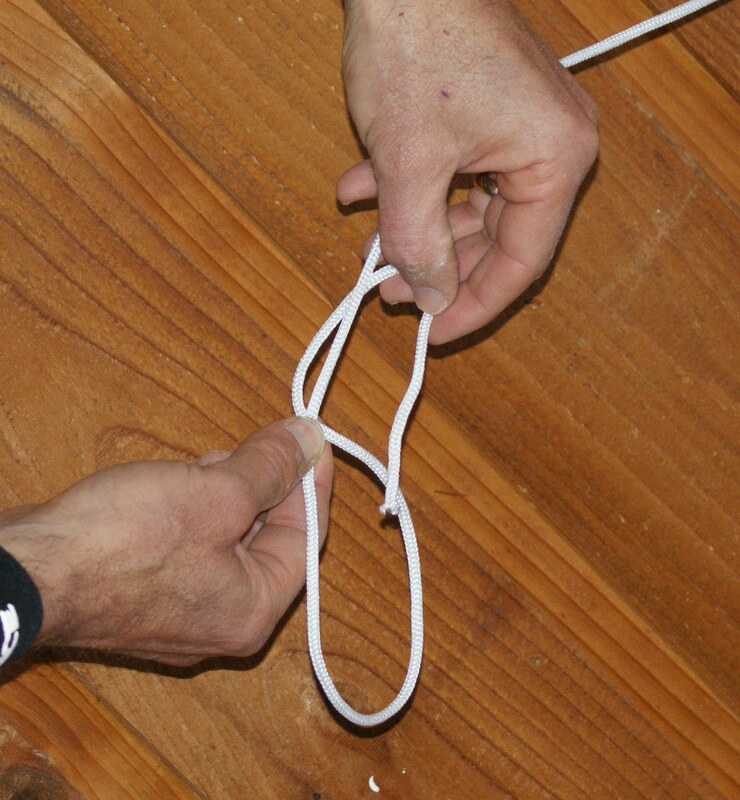 Tighten up the knot a bit, and there you have it — the bowline knot. 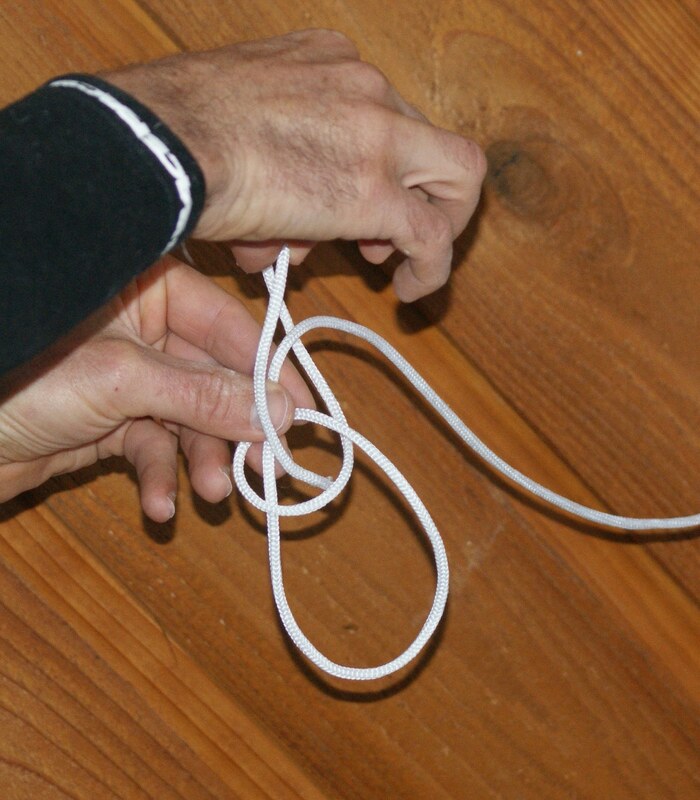 The figure 8 knot has multiple uses. 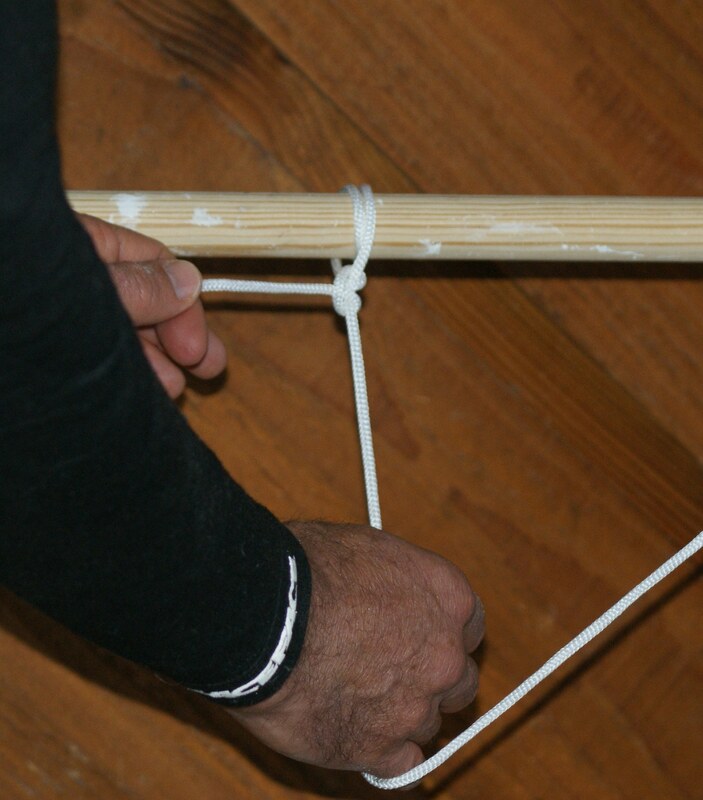 It’s handy for tying at the end of a line when you need a secure stopper to keep your line from escaping in the wind. 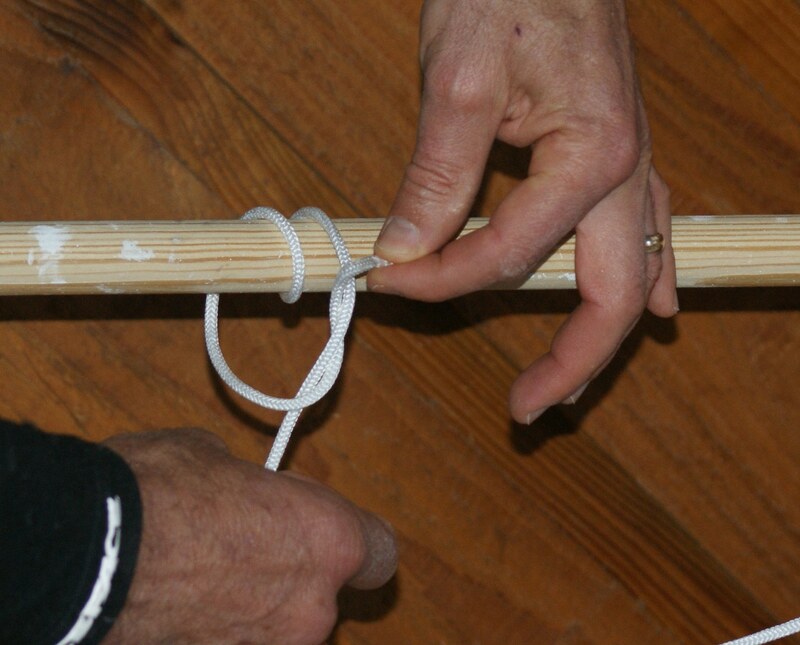 When you no longer need a stopper, the knot is easy to undo, unlike some others that often need to be cut. 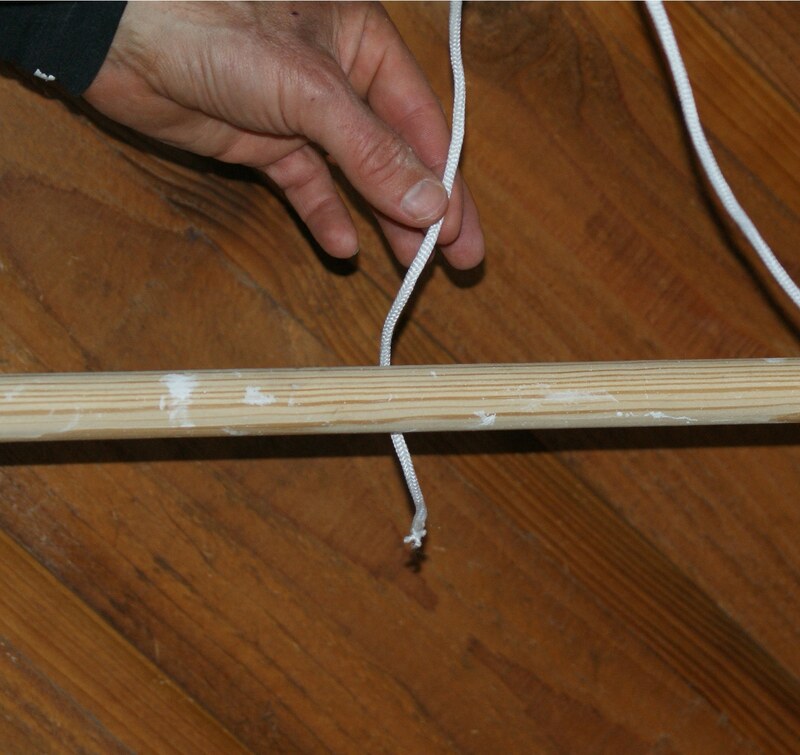 It’s less likely to fail or split than similar knots you could use as stoppers. Make a loop with the free end of the line passing above the rest of the line. Take the end of your line, pass it around and under itself and then through the loop. 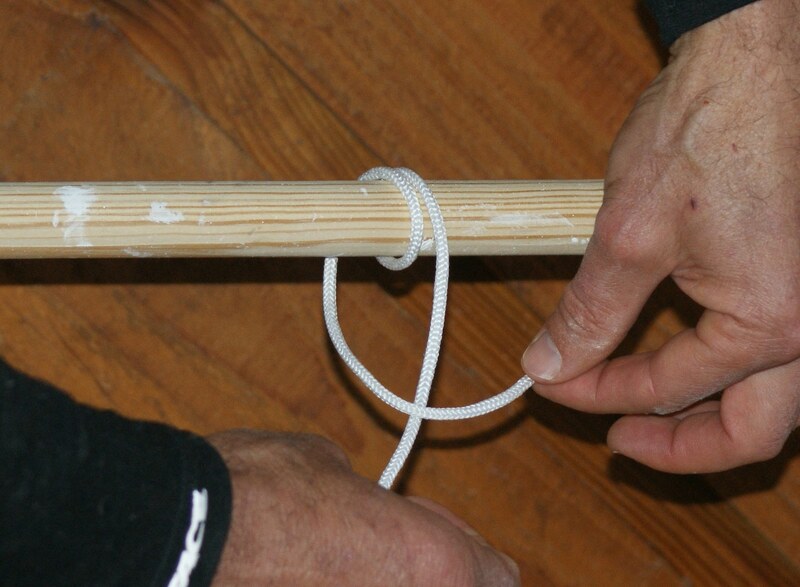 Tug on both sides, adjusting and manipulating the knot to get it where you want it. 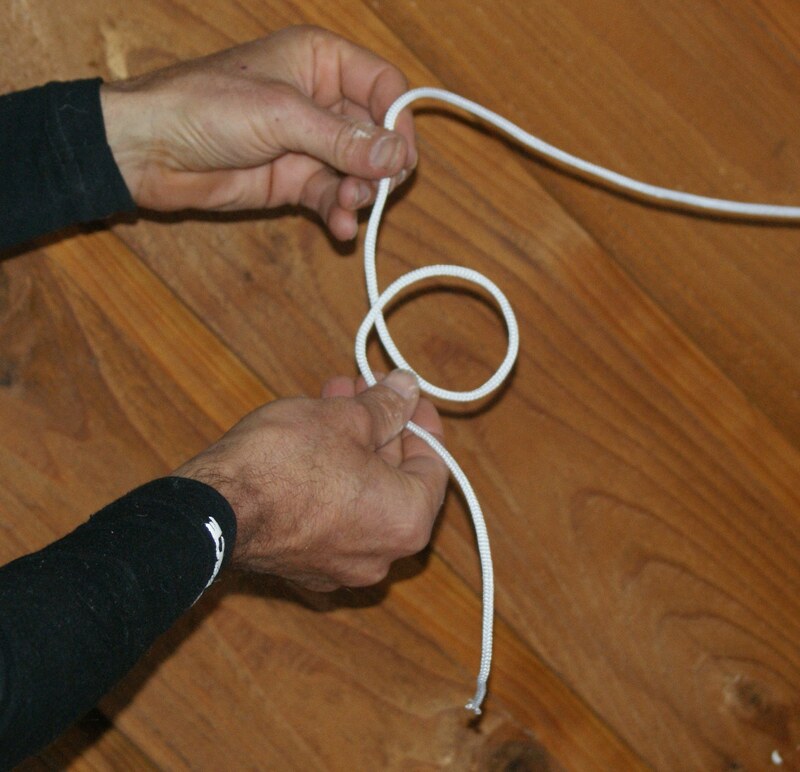 Tighten it up some more, and you have a figure 8 knot. 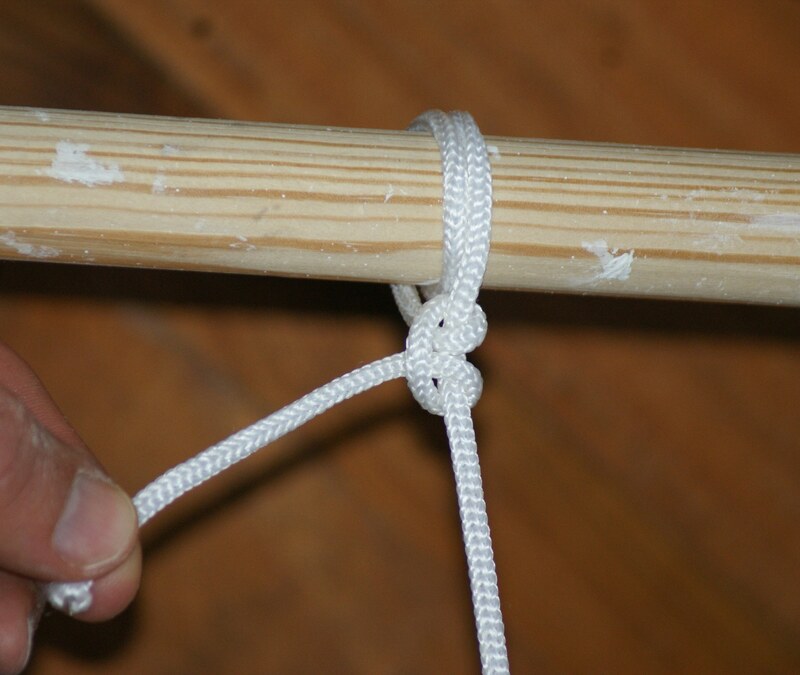 This knot is useful for a variety of purposes. We often use it for securing a length of dock line to a nearby piling. 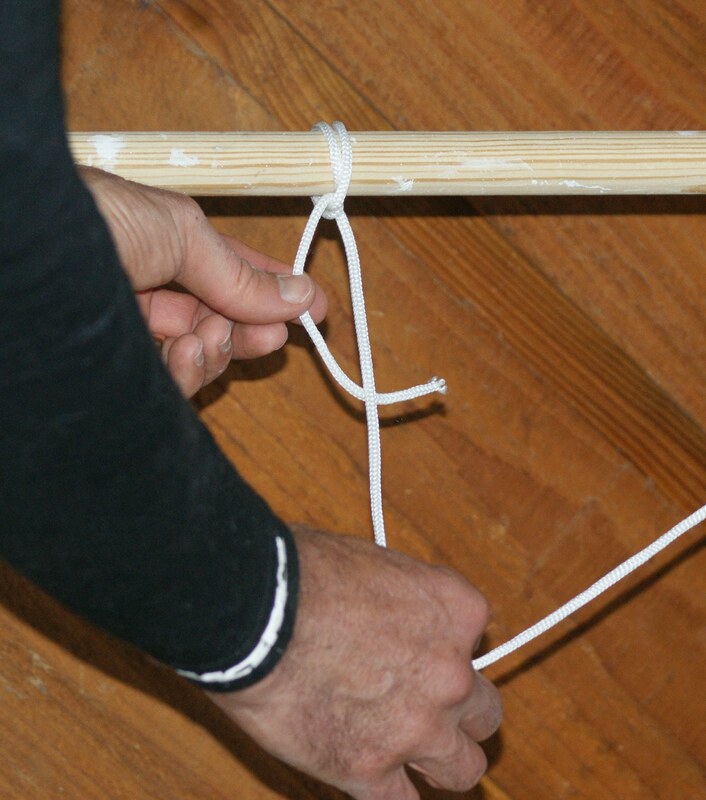 Start with the line in back of the object to be tied. Next, wrap the line twice around the object. 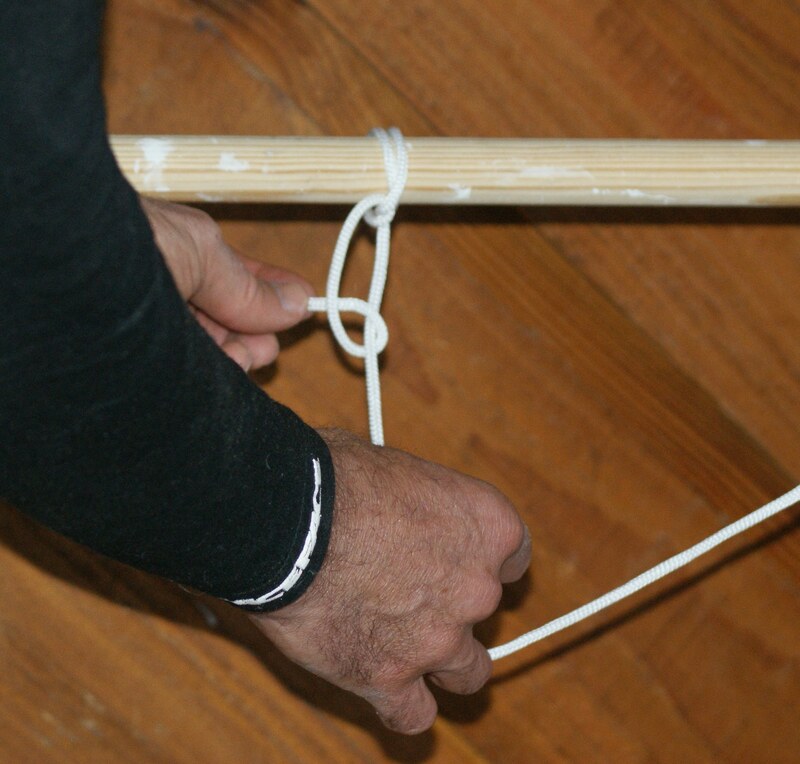 …then put it through to complete the first half hitch. Give it a good tug to secure it. The next step is to repeat the last step, bringing the working end of the line around the standing end one more time. 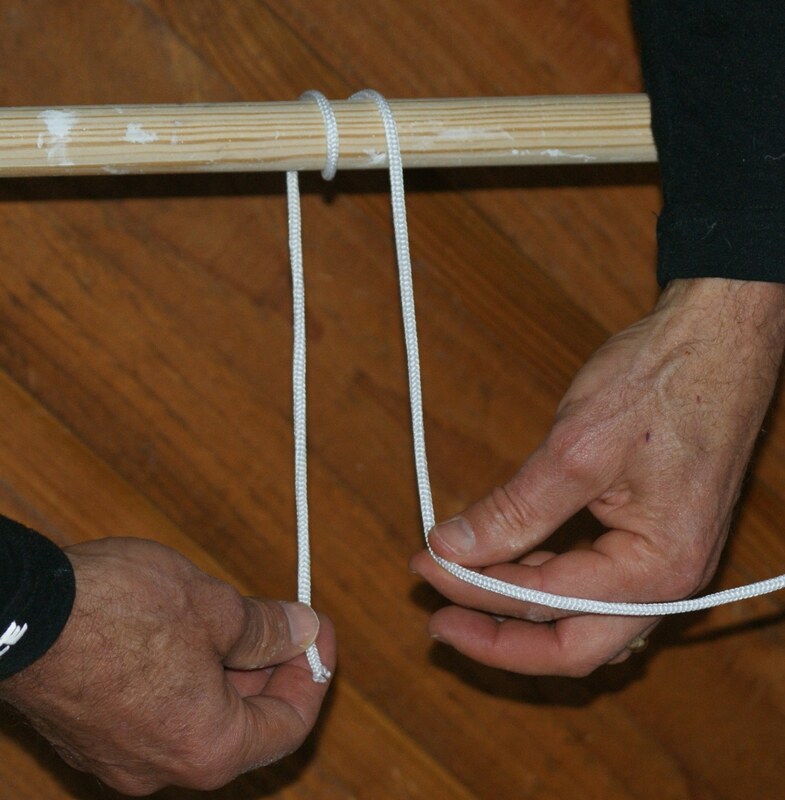 Pass it through to complete the second half hitch. Give it another good tug to secure it. There you have it — two half hitches. 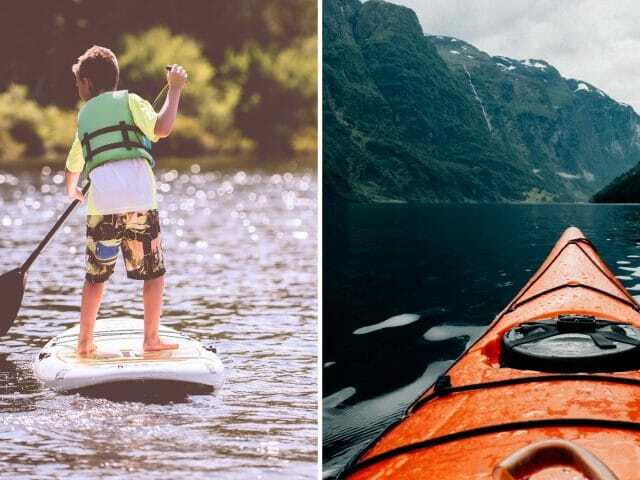 Knowing how to tie these three nautical knots will get you through many of the situations in boating that require you to tie up your boat or tie an object to your boat. What other knots do you use often?